I recently received a question related to shallowing in transition. Specifically, I was asked what angle or amount of club shallowing is ideal? Before we move on to the answer though, it is good to clarify what we mean by "shallowing". To be exact, shallowing occurs when the club's center of mass drops below the golfer's hand path. Or in layman's terms, it is when the height of the clubhead drops relative to the height of our hands. This move is a hallmark of great ball-strikers, with one notable study by Dr. Sasho MacKenzie showing that 39 out of 40 touring professionals exhibit some amount of shallowing in transition. As many amateurs tend to pull with the arms and become very steep, this move can be a "missing piece" for a lot of my students. Now, to answer our question, there is not one ideal amount or angle for shallowing. Or in other words, we want to simply make sure that some shallowing IS occuring in transition. However, for those who want a goal in mind, a rough guideline would be the clubshaft pointing at the target line half-way down. But, this may be different for you depending on your body-type and swing-style, so it is best to not worry about an exact or "ideal" amount. Raise Your Arms to Shallow Understand the upper-arm movements associated with proper club shallowing. Club Drop Shallowing A drill to help students feel proper arm and club shallowing in transition. 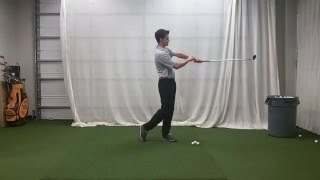 Shallow Position Vs Shallow Movement This video answers a member question, "where should the club point..."
Combo - Arm Shallowing and Left Tilt You often need to work on two moves at the same time to achieve mastery of either. Case Study - Indirect Arm Shallow See an example of how to think your way through working on your swing. Major Movements That Shallow The Club In Transition The major shallowers in transition demonstrated. See if you're missing your key. Horizontal Swings Are Shallow Shallow arms are a key component to a body driven swing, but not everyone feels them the same way. Visualizing Shallow Arms Not everyone is a feel learner, seeing what shallow arms looks like can help those who must visualize. Connecting Arm Shallowing To Supination Arm shallowing is a widely accepted best practice, but the reason is not always clearly explained. Analysis - Examples of What Shallows The Downswing In this analysis video we explore options for shallowing the club on the downswing. Arm Shallow Not The Body Shallowing out the club in transition is an important part of a golf swing, but there are better ways to do it than others. Feet Together - Shallow And Wipe Release Training The body does a great job of shallowing the club, but in this drill you are forced to do it all with the arms. Shallow Timeline - What Shallows At What Points In The Downswing Learn what movements typically tip she swing path too shallow at different points in the downswing. Experiencing The Arm Shallow Timing Learn what it's like to NOT pull with your arms to start the downswing. Tee'd Up 7-Iron - A Feel Based Shallow Drill Use a 7 iron and a ball tee'd up a few inches to help train the sweeping motion of the driver. Water Bottle Transition - Feeling Arm Shallowing Use a water bottle to exaggerate the feel of the forearms during transition. Understanding Steeps And Shallows A golf term that is important to understand is this concept of steep and shallow path of the club. Watch this video to understand what this really means.